A 60-year-old man was diagnosed with psoriasis 4 years ago. 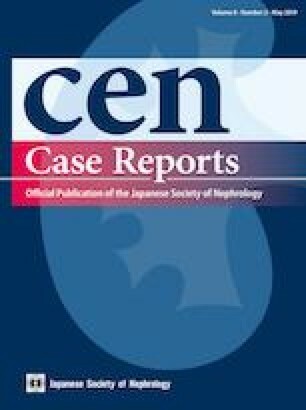 Treatment with adalimumab (a monoclonal anti-TNF-α antibody) became ineffective 1 year ago, and proteinuria and urinary occult blood were detected. Treatment with topical medicine, ultraviolet therapy, and etretinate resulted in remission of psoriasis, and proteinuria and hematuria also improved. For maintenance of remission, treatment with secukinumab (a human anti-interleukin-17A monoclonal antibody) was initiated. After the induction phase, treatment was changed from once a week to once every 4 weeks. After 5 months, he developed nephritis with kidney dysfunction, hematuria, and severe proteinuria (14 g/g Cr) accompanied by pitting edema. After admission, treatment with secukinumab was continued. Kidney biopsy revealed IgA nephropathy with fibrocellular crescents, and immunofluorescence analysis did not detect galactose-deficient IgA1. With these findings, he was diagnosed as secondary IgA nephropathy associated with psoriasis. Tonsillectomy followed by steroid pulse therapy prevented proteinuria and kidney function. In this case, treatment of refractory psoriasis with secukinumab and tonsillectomy was effective, leading to remission of relapsing secondary IgA nephropathy. Therefore, secukinumab might play an immunological role in the treatment of nephropathy. All the authors have declared no conflict of interest. Informed consent was obtained from the participant included in this article.